When looking for an appetizer one of the key requirements is often that it can be prepared in advance. No one wants to be stuck in the kitchen throughout their party and no one wants their guests to be eating cold food that should be hot. This recipe meets both of these criteria. You can assemble these a few hours ahead of time and keep them refrigerated. You could even make the filling the night before. Because it only takes a few minutes to assemble, these come together really easy, so you can make them even if you only have a few minutes of prep time to spare. And best of all, they are always a big hit. Experiment with the tortilla variations for variety or just use your favorite. For these, I used a mix of spinach, sun-dried tomato and cheddar jalapeno. If you are going to use plain flour tortillas, I would change the cheese to pepper jack just to add a little bit more spice. One note is that you want to make sure your tortillas are at room temperature before you roll them so they are nice and flexible. Season the chicken breasts with salt, half of the cumin, and 1 tsp of the chili powder. Add chicken to a skillet and add about 1 cup of water. Cover and cook on med-high heat until cooked through. Add more water if necessary. Once the chicken is cooked, cool slightly and shred with 2 forks. 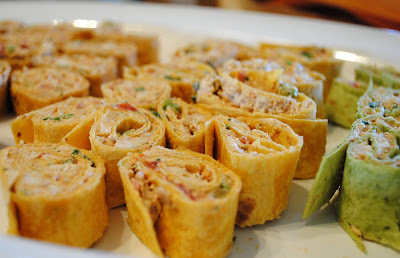 In a mixing bowl, combine cream cheese, drained tomatoes, cheese, remaining spices, garlic, cilantro and scallions. Mix together until well-incorporated. Add cooled chicken and stir together. Lay out tortillas and divide mixture evenly in the center of each. Spread into a thin layer leaving the edges clean. Roll each tortilla tightly. Do not fold in the ends like you would with a burrito but leave them free. Use a sharp knife to cut into 1" thick slices and transfer to a serving platter. (The end pieces will likely unroll a little so just eat the extras). Cover with plastic wrap and refrigerate until ready to serve. Yum - those sound great. I will have to remember this recipe for my next party. WOW! These sound like a huge hit! Great idea--thanks so much for posting! I have to give these a try. I came across your blog somehow and am your newest follower. You might come across a few of your recipes in the future on my blog at www.skinnyonadime.com! These are great! These would be good for a football tailgate! I will try them this fall. Oh my goodness, this looks SOOOO good!! If you roll them in plastic wrap before cutting them and put them in the fridge for over 30 mins and they are easier to cut. These sound delightful and I look forward to trying them. These sound fantastic! I have all the ingredients at home except for the scallions, I'll have to try and whip this up tonight - can't wait! Maybe some chopped green chilies if you don't have the scallions? @BlueMist - I would use a finely diced red onion or leave the onion out rather than green chilies which will add quite a bit of extra heat. i made these tonight and they were fantastic! my husband and picky 3 year old loved them. and myself of course. You are definitely correct about these being a hit! I actually made these last weekend for a party I was throwing at my home. I figured these would be great for a party and I was right! There was a lot of food at the party but I was proud to take home a CLEAN plate!! The only word I needed to see was "spicy" and I knew I was going to make this one (I live spicy!). Looks yummy and more than likely my kiddos will go for it too. Like Tiffany, I have two picky eaters! I made them for a Thanksgiving appetizer and they were delicious! @Blue mist, I used both scallions and the rotel with green chilies in it and it was delicious. Definitely not too spicy as the entire plate was gone fairly fast! @Julie - I've only made them as an appetizer so I don't know how many people would eat for a meal but you could probably base it on one tortilla per person. As an appetizer, this yields about 3-4 dozen rolls depending on how much filling you put in each tortilla and how thick you cut them. I cannot find scallions(or green onions as we call them here) anywhere in the store. Everyone is sold out for the holidays. Could I leave them out? @lauren - yep leave them out or add a small amount of regular finely diced onion. I use canned chicken and taco seasoning. so these are served cold right? I found you from Pinterest. 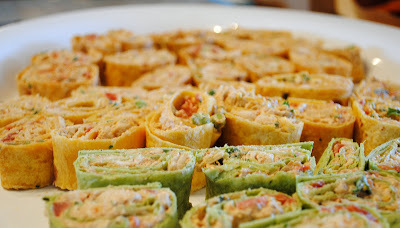 I'm hosting my son's Cinco de Mayo wedding reception in May - this is a perfect idea! I can imagine making some with a bit less heat and using the tortilla colors to designate. Thanks! @MS. Malone - this recipe will yield 3-4 dozen rolls so depending on what else you are serving, I would think 1 batch would be enough if you've got other options. These look fantastic! I'm going to add them to my Superbowl menu. Thanks for the post. About how many cups of shredded chicken do you use? I am so going to make these, and I already have cooked, shredded chicken in the fridge. Thanks! Abby, did you ever get an answer on this? I too have shredded chicken to use so would like to know how many cups... Any advice? Thanks! I'm not positive but my guess is 3-4 cups of shredded chicken, its about 3 chicken breasts. They are so delicious!!! I just finish making them for our ladies fellowship at church tonight!!! Just made them tonight for a birthday party. They were great and have already received a request to make them again for another get-together. Do you think I could assemble them the night before or would they get too soggy? Did you ever pre assemble the night before?? Did the get soggy?? You can make them the night before and they will be fine. I've only rolled them the morning of the event so they sat for a few hours in the refrigerator but I've definitely made the filling the night before. I would guess you would be fine making them the night before but I can't say for sure. Looks delicious! Gonna have to try these. Thanks! I would really love to try this recipe it sounds absolutely delicious, but I was wondering if it is really spicy? If so what could I do to bring it down? If you could please lmk id greatly appreciate it! :) thank you! These are not overly spicy however you could reduce the spice by using mild rotel or regular diced tomatoes or mild salsa. I think they should have a little kick so I would go ahead and try at least the mild rotel unless you really don't want any heat at all. These are DELICIOUS! Thank you! I made them Saturday for an evening party. 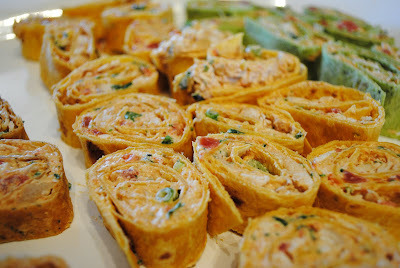 I still had a few extra rolls in the fridge and we ate them Sunday and Monday- still very yummy! These look delicious and I really want to try them but is the cream cheese flavor overpowering? No the cream cheese just makes the filling firm & creamy. These are usually a staple for any get together here in SE Texas. I have seen salsa mixed with cream cheese & shredded cheese; good too. Going to try this recipe for a appetizers. I have done similar one and rolled them the day before. The stay together better and the flavors blend. Will try it with these to. Can't wait to try this! Looks so good! I can't find ancho chili powder in the stores. Will hot mexican chili powder work? wow!!! My mouth is watering, but since I am trying to cut back on calories, maybe I will try using Laughing Cow cream cheese and start with half the recipe to see if it works and also use lo- carb tortillas. I made these for a high school graduation party and all the kids wanted the recipe~~~ thanks so much. I am making them for another graduation party this Saturday! Delicious! I even left out the chicken and it was still delicious! I made these yesterday. They were a HUGE hit! Thanks! I found you via pinterest. I made them today with my 15-year old granddaughter. We tried them at my niece's last weekend. I wanted to make them a tad less spicy so I used regular chili powder and black pepper. I followed all other recipe instructions. Perfect for me! Granddaughter liked your original version better. HI, can someone tell me what size can of rotel they used? I have either a 10 oz can or one of those larger ones. It's the regular 10 oz size can. hmz .. where do gt ur coLorfuL tortiLLaz at? ii dfnteLy wna try ths tooz. tnx 4postn! How may roll-ups does this recipe make? I'm only feeding 8 people. Can I freeze what's left? You will slice each tortilla into 6-8 slices so you'll get at least 30 out of this. I would cut the recipe in half if you are doing appetizers for 8 people. I've never frozen them so I dont know how they would hold up. I made these today & we at them while watching the Rose Parade & the Rose Bowl. They were good! I have seen where a couple of people have commented or asked about the ancho chile powder. Unfortunately, I haven't seen any responses. I, too, would like to know about a substitution for ancho chile powder. Any help would be greatly appreciated. Just use regular chili powder. These are so good!! I made them tonight for a birthday party tomorrow and I had to slap away picking hands before they were even plated! I also decided to do one platter of spicy ones and one platter without the spice for those who prefer mild. I also cut them a litter thinner to make them stretch a little more! Great recipe :) will definitely make again! Should I store them in the fridge overnight in the tortilla wrappers or leave separated until the morning and put them together and then slice them up? I'm wanting to make them the night before and take them for lunch at work. I don't want them to seem mushy. They will be fine overnight in the fridge. If I make them the night before, I roll them, wrap each Tortilla wrap and the unwrap and slice the day of. Here is my first comment: these are fantastic!!! I have made them a couple of times and they are delicious. Here is a my second comment: why do people comment just to say "these look so good." It's not exactly helpful to have to read through 25 "these look so yummy" comments when I just want to know if they're good or not. Anyway...these are awesome. Make them. These are yummy. I split the recipe in 3 different batches and added different ingrediantes to each batch. I also added red peppers and celery with mild cheddar in one. I added scallions & bacon bits and pepper jack to one batch. The last batch I added all of the extras shown above and also green chilies and a mix of 3 cheeses (mont. jack, pepper jack & cheddar). All are the bomb. I'd even made the topping and put them on crackers too instead of tortillas. Use this recipe as a dip as well as pinwheel appetizers. I made these this last weekend for teen volleyball players, younger players and coaches and everyone loved them. I didn't have any ancho chilli powder but they turned out yummy still. Thank you! I made these this morning for my husband's party, everybody loved them!! they even asked me what I put in there to make it sooo good! !they all wanted a recipe, I followed the exact recipe , came out perfect!will definitely make these again. thank you so much,this recipe rocks!! How long do you cook the chicken? I made these and my kids devoured them! Thank you for posting this simple recipe. Its easy to whip up last minute when you have left over coked chicken. It's now my "go to" recipe for hot summer days when I don't want to turn on the oven! Thank you! !